She sat on the floor as she hugged the dollhouse. One leg an inverted v along the side, her other leg like a fallen tree over the front. She pressed her temple to the gable, and caressed its vent with her ear. As she listened, she stroked the pitched roof with one hand, feeling the rise and fall of each shingle as she remembered how carefully she had carved each and all of them. With her other hand, she ran up and down the length of a perfectly made downspout. One he had never needed, not even now, as she made it rain on his front step. “Play it again.” She imagined she heard a sigh of impatience. His words climbed the dollhouse walls from inside, and reached her hungry ear. “Please, play it one more time. One last time.” She lowered her head enough to catch a glimpse of the music room, and its centerpiece, the smallest piano in the world. He still sat at it, but his hands didn’t move. “Please… please.” His chest rose and sank visibly as he brought his tiny fists onto the black and white keys. Eighty-eight keys, she thought, a fortune, made in Japan, and just for you, my beloved. 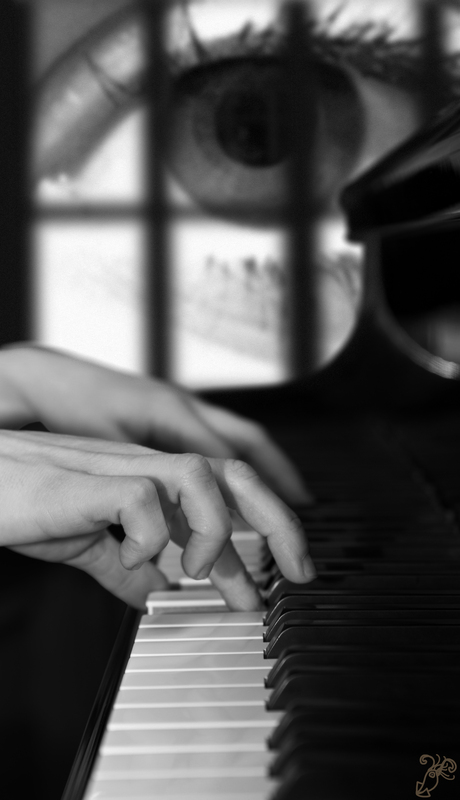 As he touched the beautiful instrument without heart, without love, the ceiling above her sank another inch. It was covered in black mold. She closed her eyes, and listened to nothing but him, to the spell he cast with his fingers. Behind her, the wall cracked open like curtains struggling to part, and breathed ancient dust into the room. He played on, until the piece was over. She watched him stand up and away from the piano. He looked at her through the window, and even through her tears she could see his disgust. He turned his back, and walked out of the music room. She peeled herself away a few inches from the dollhouse, and watched the front door with eyes unblinking. A rusted pipe exploded in the cold basement. “You are not!” She palmed the floor and pushed to pivot herself toward him. One leg bumped the side of the dollhouse, moving it behind him. Her other leg had given him more room, but it was pressed to the floor, and he’d have to walk its entire length to clear her foot. Instead, he faced her, his eyes ablaze. “You can’t stop me. I gave you ten years of my life. No, you took them. You took me as though I was a thing, an object. For ten miserable years I’ve not known what happened to my wife, my mom, my dad. My pets are dead, my friends think I’m dead. My tours, my music, my sense of self: you destroyed it all! She brought her fists down around him, and pounded the floor with all her strength. He jumped in the air as the rotting boards cracked and sank into rounded shapes that spewed splinters and displaced dust. When he landed, he looked up at her in alarm. Her words only seemed to displace his fear, and refuel his anger. “Do it,” he spat. “Kill me. It’s either a quick death by your hand, or a long death, waking up every morning in this hellhole, with you. Do your worst.” He turned, and started walking along her inner thigh. She let him. The ice in his words penetrated her heart, and dried up her tears. In the kitchen, the tile floor sank at the center, and spilled into the basement, bringing appliances with it. She ignored every crashing sound. “I have a wife. I’m going to-“ Something in her eyes stopped his lips from moving. He shook his head, and resumed his departure. She watched him pass her foot, and make his way toward the front door. He would not need to open it. When he reached it, he turned to face her, and spoke one last time. She said nothing. She watched him for a moment, until he vanished under the door. As she turned to cradle the dollhouse again, the center beam that held every ceiling joist and rafter in place far above her, burst open in more than one place. It all came clawing down at her. Wow. Dark. Of course this means something, it lends itself to an easy metaphor, but I’m going to avoid analysis. Leave that to the philosophers and historians. Haunting, chilling. Yes, she’s torn a little man from his life, but she’s as much a victim of her compulsion, her all-consuming need. I don’t want to see her ruined like this! But this sounds like waking up from a dream, pausing for a moment to realize the world hasn’t fallen into place the way one so desired. Even if it’s just a hypothetical, taking a fleeting thought at a juncture and following down its own path. The conflict, here… she wants, so badly. But there was no balance, there was only him, her tiny obsession, and the world moved on around her… I feel badly for her. I’d try to heal her, work it out with her, but she’d only capture me and reenact the entire setting without learning a thing, convinced that this time her love would be enough to bend the universe to her will. It can mean many things, but what it means to me the most, is that some days I’m going to wake up with an idea in my head, and I can wait it out long enough to kill it, or I can write to down, as I did today. Throughout my life, I’ve done the former more often than the latter. In my constant effort to grow, and expand my mind, I’m often doing the opposite of what I’m inclined to do, writing what I might have never written before, and… this one doesn’t happen as frequently, buy I’ve been trying to express what I might have kept to myself in years past. The results are a mixed bag of hilarity and silliness. It’s a good flavor. Not that I’ll ever have the chance to find out! And yes, she’s beyond healing, beyond words, beyond comfort. That’s the counterpoint to our reality, from which I draw succor: perhaps we are not. I don’t think it’ll change you, if you start to act on these story impulses rather than drown them in the bathtub. That is to say, I don’t think it’ll morph you into someone you don’t want to be, while it will almost certainly diversify your toolbox, which is awesome. I’ve written stories I’ve been uncomfortable with, and sometimes it’s clear that I should have handed the idea off to another author with whom it would be more at home, but other times, I’m pleasantly surprised to discover I have a few new tricks up my sleeve. I wonder if you go through the same revelation. It did feel like a cautionary tale. It felt like a chastisement, even, but I wasn’t going to be so audacious as to bring that up. My heart breaks for her, but I understand she was broken and there was no other way this could go. She wouldn’t be good to anyone because she didn’t know to tend to herself, prioritize herself, like you said. Let the little guy’s healing begin. I hope she can rebuild and see that there’s hope for the future. I guess it’s not impossible he might return? A period of separation might show him just how lucky he was to be owned by her. Or maybe he’ll find there’s nothing out there in the world for him and settle for her love, while rebuilding his own for her. It’s always heartbreaking when one person wants to capture, and the other doesn’t want to be captured. She’ll find another though. One who can own her back as much as she owns him. In the world of a perfect story, she would. She would emerge from that rubble reborn, and become a better person. But she doesn’t. He does’t return, and in fact, when she passes, he recovers his original size. He’s naked, and in the middle of the road, probably… or about to be chased by a cat. But he regrows, and runs home to his wife and children, who have always loved him, and delight in seeing him again. He’s a strong little one. He’d never be one to think there’s nothing out there for him. That’s what attracted her to him in the first place, when she saw him (during a concert where he performed), and took him (at the patron afterparty). He was the flame, and she the moth. She saw in him the light she thought she didn’t have, and then lost to her mental illness. That’s a powerful piece, Hug. Succinct, poetic, daunting in its passions. Well done! I imagine you biting your lower lip as you crafted it. Thank you Scott! Yes, biting my lower lip, tearing up a bit, growling at my words on the screen, cursing at my little fornit as he laughed, perched on my shoulder, even as he cheered me on, and nodded and ah-ha’ed at my words. Sorry little scamp. Well that was dark. Good, but dark, genuine as a story. Though even understanding why he would want to leave (I mean, 10 years of abduction, that is a lot) you gotta wonder if after all this time he wouldn’t be better of with her. During that time his wife probably rearranged her life without him, so did his friends and family, and if he comes back (if he does, that’s a long and dangerous trek to get there) he can disrupt everything. It’s a dilemma for sure. He was smart enough to wake up from his Stockholm-syndrome haze, which I imagined drowned his every thought of escaping at some point, when things were not that bad, when she hadn’t fully manifested how lost she was in her single-mindedness. In my head, his wife did get on with life, after a fashion. She might have met and cared for other men, but he was the one her heart always chose, above others. In it, he still lived, and her loyalty is about to be rewarded, big time. That’s the center of light in all the darkness. And of course, he returns triumphantly to the stage, and performs in the most prestigious music halls in the world. Though he doesn’t ever talk to any fans. Never. I like the way she draped herself around the dollhouse. Creepy and oppressive, like her personality. Good one, U.